The baptizing Christ washes us clean from all sin in the waters of the Jordan. He also restores the primitive order that was abolished by sin and creates a new person: "Put on the new nature of God's creating, which shows itself in the just and devout life called for by the truth" (Eph 4:24). The Fathers of the Church agree, and teach that the Lord Jesus ~ the New Adam ~ restores us to the state of integrity possessed by the first Adam before his fall. This work of recreation is expressed in the Holy Mystery of Baptism by the anointing with the "oil of gladness" before the rite of the water. It is not yet baptism, but a necessary preparation for it. Only a restored, recreated person can be united to Christ. The anointing with the oil of gladness means that we sinners are first restored into the state of original integrity; now we can be incorporated into Christ in the baptismal water. This anointing differs from the Chrismation anointing which, after the rite of the mystery of baptism, communicates Pentecostal grace. The oil of gladness is not chrism, it has, nevertheless, its own special effects. "It purifies the traces of sin by burning them," St. Cyrill of Jerusalem says. The servant of God is anointed with the oil of gladness. Six parts of the body are anointed with the oil of gladness. ~ to open the mind to understand and accept the mystery of faith and to know the truth. ~ for the healing of soul and body, and that we may love the Lord God with all our heart, our whole soul and whole mind, and our neighbor as ourselves. ~ that we may eagerly take Christ's gentle yoke and joyfully carry his burden and renounce all carnal desires. ~ that we may hear the faith and accept the divine teachings of the Gospels. ~ that we may raise our hands without blame toward the sanctuary and always do what is right and just and bless the Lord. ~ that we may walk in the footsteps of Christ's Commandments. Through the anointing of our senses our whole body is made holy and we find favor with God. Our senses make us aware of our world and all of life so that we may grow to appreciate God who created us and all the beauty that surrounds us. Love is a personal relationship and commitment; it cannot be imposed but only offered. Salvation is a process for leading us to the fulfillment of life in Christ; it is the perfect acceptance of the Fatherhood of God. Baptism is therefore the reorientation of the soul, the reconstruction of the likeness which flows from our insertion into the Resurrection of Christ. We must learn to trust and believe and allow God to win us over. Without this belief no love is possible. Knowing another person in love reaches to the depth of the self of the other person. In that depth there is communication and identification. 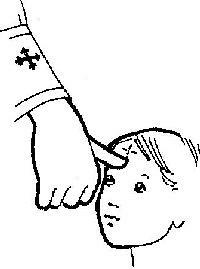 For this reason we are asked during the liturgy of baptism: "Do you believe in Christ?" And we answer: "I believe in Him as King and God." And we are invited to recite the Creed. This saying of the Creed is not a mere recital of a list of truths. Rather it is a plunging into that "river of flowing water" which is the life of the Trinity. We plunge into the life of the Father; we give ourselves up to the life of the Son who died for our salvation; we surrender to the life and action of the Holy Spirit who will fill everything and make us rise to the eternal life to come. The Creed, therefore, is recited solemnly and with conviction. Such a proclamation involves a change in our whole being; in our consciousness and awareness of God and others. Baptism is called "newness of life." Since life is a process, we commit ourselves to keep moving into the "mind of Christ." The "old life" was a disorientation where we found ourselves wandering away from God in isolation and self-centeredness. New life is "putting on Christ" with whom we are in the Father. God brings forth His Son anew and breathes His Spirit into us. Now let me speak to you of the mysteries themselves and the contract which will be made between yourselves and the Master. In worldly affairs, whenever someone wishes to entrust their business to another, a written contract must be completed between the trustee and the client. The same thing holds true now, when the Master is going to entrust to you not mortal things which are subject to destruction and death, but spiritual things which belong to eternity. Wherefore, this contract is also called faith, since it possesses nothing visible but all things which can be seen by the eyes of the spirit. There must be an agreement between the contracting parties. However, this is not on paper nor written in ink; it is in God and written by the Spirit. The words which you utter here are registered in heaven, and the agreement you make by your tongue abides indelibly with the Master. For three hundred years the voice of prophecy had been silent in Israel. "There is no longer any prophet," lamented the Psalmist (74:9). Was God silent? Was He not to speak to His people any more? After three hundred years God finally breaks His silence. He sends another prophet: John the Baptizer. In John, God spoke again through "the voice of one crying in the wilderness," and the people recognized the voice and commands of a prophet. So they came and listened. "There went out to him all the country of Judea, and all the people of Jerusalem." He came as the last and the greatest of the Old Testament prophets. John came to point out Him whom all Israel expected: the Messiah, the Savior, the Light of the World. Of all the prophets to proclaim the Messiah, John was the only one privileged to point to Him and say: "Behold the Lamb of God, who takes away the sin of the world." 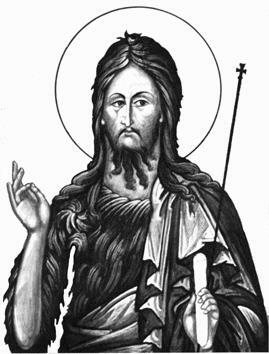 The icon of John the Baptist generally depicts him as pointing because that is his privileged place in history; he points out Christ as the expected Savior. John was the "voice of one crying in the wilderness." A wilderness is a place where everything and everyone is lost. When a person is lost in the wilderness, the greatest good that can happen to them is to hear a voice that can lead them out. Such was and is the voice of John, calling to us who are lost in the wilderness of sin, and saying: "Behold, the Lamb of God, who takes away the sin of the world." Grandma told the following story to us often because she believed it held a most important lesson. A wealthy merchant was traveling in a train compartment with a poor old man. The merchant treated the elderly man with disrespect, rudeness and disdain. When they reached their common destination, the merchant found the station thronged with people waiting to greet a holy teacher. The wealthy merchant learned to his chagrin that the old man in his compartment was that saintly teacher. Embarrassed at his disgraceful behavior and distraught that he had missed a golden opportunity to speak in private to a wise and holy man, the merchant pushed his way through the crowd to find the old man. When he reached the holy teacher, he begged the teacher's forgiveness and asked for his blessing. The teacher looked at him and replied: "I cannot forgive you. For forgiveness, you yourself must go out and beg it from every old, poor person in the world." An important factor involved in true repentance is a changed direction. This change of mind and heart in repentance is so thorough that it leads to a changed direction in life. The Jewish word for repentance means "to turn." The Greek word for repentance literally means "a change of mind." This is exactly what true repentance is: a turning away from evil and a turning towards God. One day a man who was lost asked someone how far it was to the city he sought. He was told: "If you keep going the way you are going it is about 25,000 miles. But, if you turn back and go this way, it is only about three miles." A U-turn may not be allowed on our streets because it can tie up traffic and cause accidents, but it is often the only thing we can do in life especially when we are headed in the wrong direction. St. Paul made a "U-turn" on the Damascus Road. If repentance is anything, it is a U-turn, a reversing of the direction of our life so that we face God. Because we have taken one step down a wrong road is no reason, we should take another. Genuine Christianity is based not on knowing about Jesus but knowing the Christ. Eastern Fathers of the Church, like St. Gregory of Nazianum, devoted some of their studies to identify our Lord Jesus through the various titles ascribed to Christ in the holy Scriptures. Gregory mentions some fifty titles. St. John Chrysostom gives about twenty-five images in the Divine Liturgy. Each of the Fathers attempts to grasp an intimate, dynamic aspect of Christ and our union with Him. We all love a mystery. Every title of Christ can be called a mystery. One of the most intriguing titles, that is indeed a profound Christological mystery, is the "Body of Christ" or Mystical Body of Christ." St. Paul originated this image when he wrote: "Have you forgotten that when we were baptized into union with Christ Jesus we were baptized into his death? By baptism we are buried with him, and lay dead, in order that, as Christ was raised from the dead in the splendor of the Father, so also we might set our feet upon a new path of life" (Rom 6: 3-4). Entering into the waters of baptism, we join Christ in His death as we die to sin, to evil and to all that keeps us from union with God. We enter into new life as we are joined to the resurrected Christ. The new white garment we receive, a royal robe, signifies that we have "put on Christ," meaning we have died in Christ and are now resurrected in Him. The mystery is resolved when the newly baptized enters not only into Christ's resurrection, but also into the body of Christ, His Church or Kingdom. 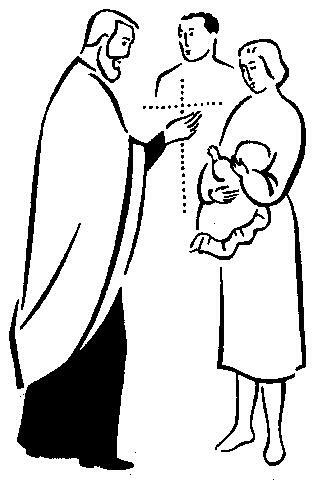 The newly baptized has received divine life thus entering into a dynamic union with Christ. He or she receives the outpouring of the Holy Spirit. St. John Chrysostom, in one of his homilies, puts it this way: "Human beings were formerly captives of sin but now they are free, holy, just, son and daughters of Christ; heirs, members temples and instruments of the Spirit." In the great mystery of baptism we die in Christ and we resurrect in Christ and we become members of His Church. We belong to the body of Christ. Each Sunday and holyday, as God's people, we gather around the One who loves us. We come to Him to Whom we belong. We gather in the place where we belong: in church. If we do not come to church, we are acknowledging that we do not belong to God. We may belong to money, to golf, to football, to TV, to shopping. We may belong to the world, but not to God. We come to church to acknowledge whose we are and where we belong. Just as at the end of our work day, we go to where we belong -home- so on the Lord's Day we go to where we belong - the Church. This is why Jesus said that at the Resurrection there will be a separation of the lambs from the goats (Mt 25: 31-46), i.e., people will gravitate to where they have always belonged, either toward the presence of God or away from the presence of God; either toward heaven or hell.